Holiday season is here and no one can stop it, shopping here and there exist to complete the Christmas list of gifts for family, relatives, and friends. Well let me help or suggest a much easier way for you to shop. This is a once a year shopping event that you shouldn't forget. 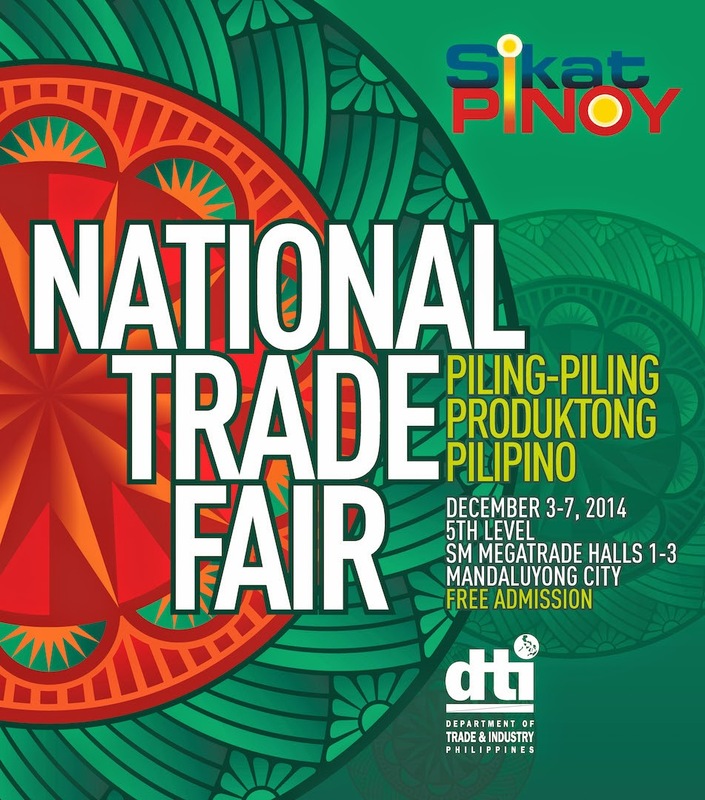 DTI-Bureau of Domestic Trade Promotion brings the best of the country’s products in the Sikat Pinoy National Trade Fair, that will soon be held at the SM Megatrade Halls 1-3, SM Megamall in December 3-7, 2014. Be it from food, health and wellness products, fashion, jewelry, furniture, home décor, handicrafts, knick-knacks, collectibles, and name it and the trade fair got and SM got it all for you. And if you’re on the look out for those one-of-a-kind gifts that show both your good taste and high regard for the recipients, this is the perfect venue for you,Sikat Pinoy National Trade Fair will be supporting more than 250 Filipino entrepreneurs participating in the the event, as there will be a special focus on 40 SMEs from Regions 6, 7 and 8 to help them recover from last year’s devastating Bohol earthquake and Typhoon Yolanda.If you were following this blog, Sikat Pinoy fairs organized for food, fashion, art, and furniture and furnishings, to provide Filipino entrepreneurs with a venue to showcase their products and expand their market presence. For more information, contact the DTI-Bureau of Domestic Trade at telephone no. 751-3223, fax no. 751-3224, or email bdt@dti.gov.ph. Please “Like” the Facebook page www.facebook.com/sikatpinoyfairs for updates on Sikat Pinoy events.